Watch First @ 4 starting at 4:00pm April 19, 2019 for your chance to win. 3. Entry. Enter by watching FIRST @ 4 on FRIDAY APRIL 19, 2019 starting during the 4:00PM broadcast. There will be a mention during the FIRST @ 4 broadcast giving the “call now” announcement, the 12th caller will be a winner if the caller meets the eligibility requirements stated in these Official Rules. Tickets can be picked up after 5:00PM FRIDAY APRIL 19, 2019 at 200 E Van Buren Street, Phoenix, AZ 85004. 9. General Release. By entering the Contest, contestants release 12 NEWS KPNX-TV, TEGNA Co., Inc., and LIVE NATION TRAIN & GOO GOO DOLLS and any other promotional sponsors, and each of their respective affiliated companies, directors, officers, employees, representatives, partners and agents from any liability whatsoever for any claims, costs, injuries, losses or damages of any kind arising out of or in connection with the Contest or with the acceptance, possession or use of any prize (including, without limitation, claims, costs, injuries, losses or damages related to personal injuries, death, damage to, loss or destruction of property, rights of publicity or privacy, defamation or portrayal in a false light). 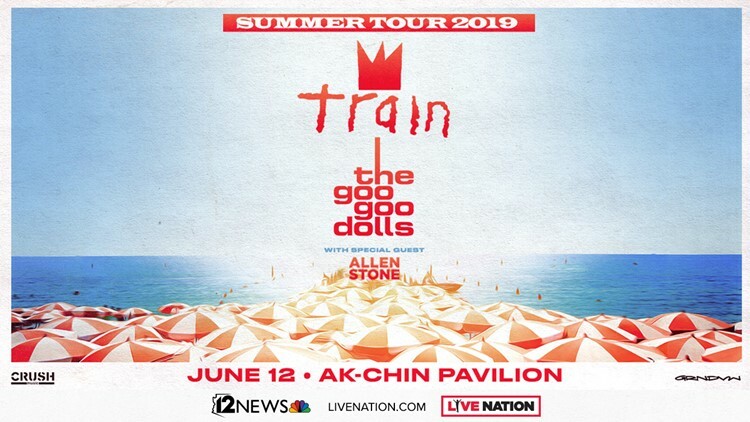 ” contest is sponsored by 12 NEWS KPNX-TV, TEGNA Co., Inc., and LIVE NATION, whose decisions regarding the selection of winners and all other aspects of the Contest shall be final and binding in all respects. Sponsors will not be responsible for typographical, printing or other inadvertent errors in these Official Rules or in other materials relating to the Contest. For a list of winners (available after WEDNESDAY JUNE 12, 2019) or a copy of these Official Rules send a self-addressed, stamped envelope to “Winners List/Official Rules” (as applicable), MICHELLE FIERROS 200 E VAN BUREN ST PHOENIX, AZ 85004. If you have any questions about this Sweepstakes, please contact MICHELLE FIERROS mfierros@12news.com 602-444-1285.